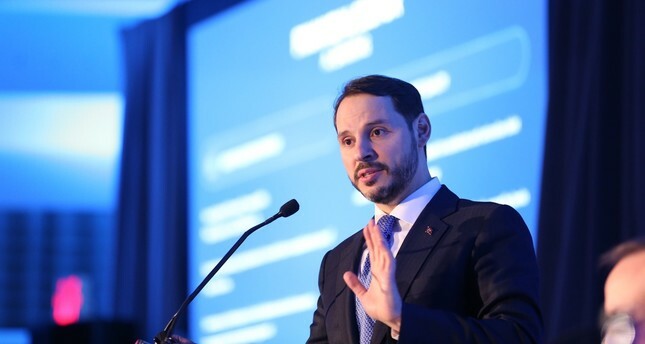 Treasury and Finance Minister Berat Albayrak presents Turkey’s new reform package at a meeting with international investors, Washington D.C., April 11, 2019. As part of the International Monetary Fund (IMF) and World Bank spring meetings, Treasury and Finance Minister Berat Albayrak had a very busy agenda as he met representatives of international financial institutions and investors. Despite a smear campaign against the Turkish economy, Albayrak talked with the world's leading mutual funds, foreign counterparts and international financial institutions in Washington D.C. Albayrak, who also met with U.S. Treasury Secretary Steven Mnuchin, mainly focused on the new reform package unveiled last Wednesday. He spoke of steps to strengthen bank balance sheets and increase asset quality and saving strategies to provide over 10 percent of national income to Turkey in five years, adding more details would be shared with the public by the relevant institutions in a short time. On the first day, Albayrak also held a meeting with Suma Chakrabarti, the head of the European Bank for Reconstruction and Development (EBRD), and his delegation to discuss the bank's investments in Turkey. For instance, Reuters published an article following Minister Albayrak's remarks during a meeting with investors, claiming that his meeting left "investors unconvinced in Washington." Contrary to the Reuters story, investors welcomed Albayrak's pledges regarding the new reform package. Turkey entered an era of long-awaited reforms following the March 31 elections. The new reform package covers a wide area from banking to insurance, inflation, agriculture and the judicial sphere. The financial reforms will delve into all areas of the financial sector to reinforce the capital structure of private and public lenders. In addition to the financial sector, the second area of reform efforts will concentrate on inflation. To tackle food inflation, a new agricultural policy will be announced in May. With master plans for logistics, exports, and tourism, the country aims to increase revenues and support development. Turkey's reforms in the upcoming period will also be implemented in the judicial sphere since the relation between a fair and effective legal system and strong and sustainable economic development is crystal clear. The events of the last six months were also brought up during the meetings. Media reports quoted investors as saying, "After August, we did not think Turkey could turn this tough bend," while another participant praised Turkey's performance saying: "Your six-month performance is admirable. This successful performance was a very important message and credit in terms of markets." "It was very productive. Of course, the prominent issue was the new reform package in which investors were quite interested," reports cited ministry sources as saying. "They wanted to learn a lot of details. Our minister was quite clear about implementing the commitments. They also shared details on various topics. It was extremely helpful. All issues were handled in a friendly way." Following the IMF and World Bank meetings, the treasury and finance minister is to attend the 37th Annual Conference on U.S.-Turkey Relations organized under the theme "Back to Business: Maintaining Partnership in Difficult Times." The three-day event, from yesterday until tomorrow, organized by the Foreign Economic Relations Board of Turkey (DEİK), the Turkey-U.S. Business Council (TAİK) and the American-Turkish Council (ATC), will discuss ways to reach a $75 billion bilateral trade target. An increase of Turkey-U.S. trade volume, currently close to $21 billion, to $75 billion has been one of the most-discussed topics in recent phone calls between President Recep Tayyip Erdoğan and U.S. President Donald Trump, who agreed to further enhance economic relations.